Station & Multi-winding to suit specific needs & L.T. Transformers for generating Stations. 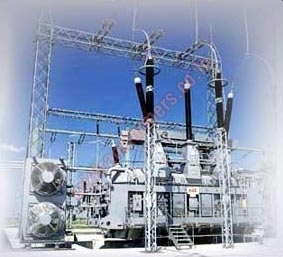 Upto 10 MVA ,3 Phase , Upto 33Kv, ONAN / ONAF / OFAF /OFWF Cooling A power transformer characterized by inner and outer low voltage winding sections and a high voltage winding section disposed there between. The low voltage windings are comprised of a plurality of pancake coils, and the high voltage winding are comprised of a plurality of conductor strands spirally wound for a plurality of coil layers. The low and high voltage winding sections are laterally spaced with the low voltage windings disposed in side-by-side positions and adjacent to the high voltage windings. The high voltage windings having a smaller turn height than the low voltage windings and having conductor strands of smaller gauge than the pancake coils of the low voltage windings. A Power transformer is an electrical device that transfers energy between two or more circuits through electromagnetic induction. A varying current in the transformer's primary winding creates a varying magnetic flux in the core and a varying magnetic field impinging on the secondary winding. This varying magnetic field at the secondary induces a varying electromotive force (EMF) or voltage in the secondary winding. Making use of Faraday's Law in conjunction with high magnetic permeability core properties, transformers can thus be designed to efficiently change AC voltages from one voltage level to another within power networks. Transformers range in size from RF transformers less than a cubic centimeter in volume to units interconnecting the power grid weighing hundreds of tons. 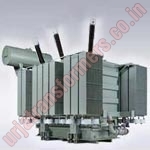 A wide range of transformer designs is encountered in electronic and electric power applications. Generation of electrical power in low voltage level is very much cost effective. 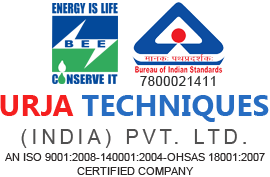 Hence electrical power is generated in low voltage level. Theoretically, this low voltage level power can be transmitted to the receiving end. But if the voltage level of a power is increased, the electric current of the power is reduced which causes reduction in ohmic or I2R losses in the system, reduction in cross sectional area of the conductor i.e. reduction in capital cost of the system and it also improves the voltage regulation of the system. Because of these, low level power must be stepped up for efficient electrical power transmission. This is done by step up transformer at the sending side of the power system network. As this high voltage power may not be distributed to the consumers directly, this must be stepped down to the desired level at the receiving end with the help of step down transformer. These are the uses of electrical power transformer in the electrical power system.Two winding transformers are generally used where ratio between high voltage and low voltage is greater than 2. 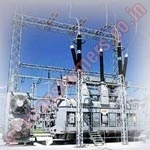 It is cost effective to use auto transformer where the ratio between high voltage and low voltage is less than 2. 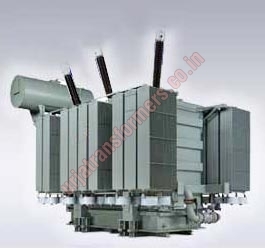 Again three phase single unit transformer is more cost effective than a bank of three single phase transformer unit in a three phase system. But still it is preferable to use than the later where power dealing is very large since such large size of three phase single unit power transformer may not be easily transported from manufacturer's place to work site. The high reliability of these transformers ensures maximum availability, lower maintenance costs and reduced life-cycle costs. Our ultimate goal is to exceed our customers' expectations continually by delivering the highest quality services. Power transformers comply with our quality policy by:Consistent management focus on quality;Continually improving the effectiveness of our Quality Management System;Understanding our customers goals and embracing them.